I’m standing in a meadow with hundreds of yellow rattle seedlings around my feet. 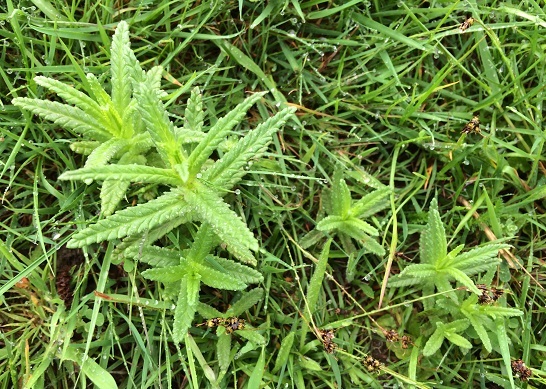 The ground is thick with them - there must be many thousands of plants across the whole field. What’s remarkable is there were absolutely none here last year. 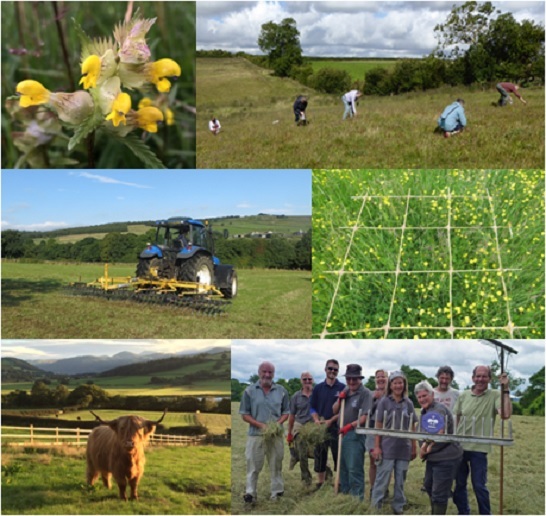 Last September, we undertook restoration of our 3 acre field at Tyddyn Afon (header picture) as part of the Coronation Meadows project. In a flurry of activity, seed was brought here from the ‘donor’ meadow – the National Trust’s Mosshill reserve, a remarkable flower-rich meadow down the valley which is the Coronation Meadow for Conwy. Our ‘receptor’ field had been prepared beforehand – scalped and harrowed until it was bare and brown - and green hay and brush-harvested seed from Moss Hill were spread across the field. This is where all the yellow rattle seed came from, and it’s absolutely thrilling to see this and many other flowers now germinating in the field (you can follow the restoration with this video and blog). For me, the excitement of what’s to come in the months ahead is on two levels. Firstly, there’s the huge personal excitement of seeing our own field begin to transform into a sea of wildflowers. Secondly, there’s the knowledge that ours is just one of many meadows being restored across the UK, we’re part of a meadows revival that’s taking place as the Coronation Meadows project moves into a very important year. We are now in the final year of Biffa Award funding. For the three project partners, Plantlife, The Wildlife Trusts, and the Rare Breeds Survival Trust, it looks like being a remarkable twelve months. The schedule of activity has just been confirmed and will see our busiest ever year, with a frenzy of activity on 58 different meadows across the UK from Cornwall to Northumberland and from Co. Down to Norfolk. Some meadows will be created from scratch, others created last year will receive a second dose of seed from their ‘donor’ meadows, fences will be erected so meadows can be grazed, plug plants will be grown and planted out and volunteers will cut hay, collect seed, spread seed and monitor the appearance of flowers. By the end of the year, the project will have seen the creation and restoration of 90 wildflower meadows across the UK, totalling 980 acres in all. This will be a rather astonishing achievement. When you remember that over 97% of our wildflower meadows have been destroyed since the 1930s, every single meadow that can be created or restored today counts towards healing the damage. 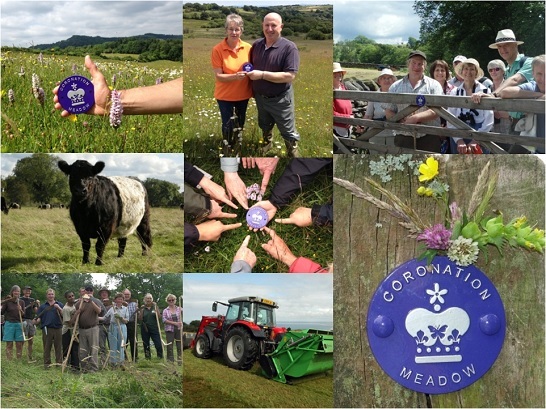 The Coronation Meadows project has also helped to initiate a sort of meadows revival. People are actually talking about meadows again. The interest in creating wildflower meadows has never been greater and many are discovering the astonishing beauty of their local Coronation Meadows (if you’ve not visited yours, they’ll be at their best in the next few months). The value of grazing by native breeds of cattle and sheep – hardy animals well adapted to thriving on wildflower meadows – is beginning to be appreciated by farmers and livestock owners. Scything courses are oversubscribed. Social media is full of pictures of meadow wildlife and magazines, newspapers and TV programmes are all featuring articles and items about meadows, bringing both their plight and their potentially brighter future to a much wider audience. At long last, it seems that there really is a buzz in the meadows.